Regan Kibby is suing to block Trump’s ban on transgender troops. Midshipman Regan Kibby with his younger sister and mother during Plebe Parents’ Weekend at the Naval Academy. The fate of President Donald Trump’s ban on transgender troops lies in the federal judiciary. In August, civil rights groups filed three separate lawsuits against the policy, arguing that it violates constitutional guarantees of due process and equal protection. Some of the plaintiffs suing Trump remain anonymous in court filings. 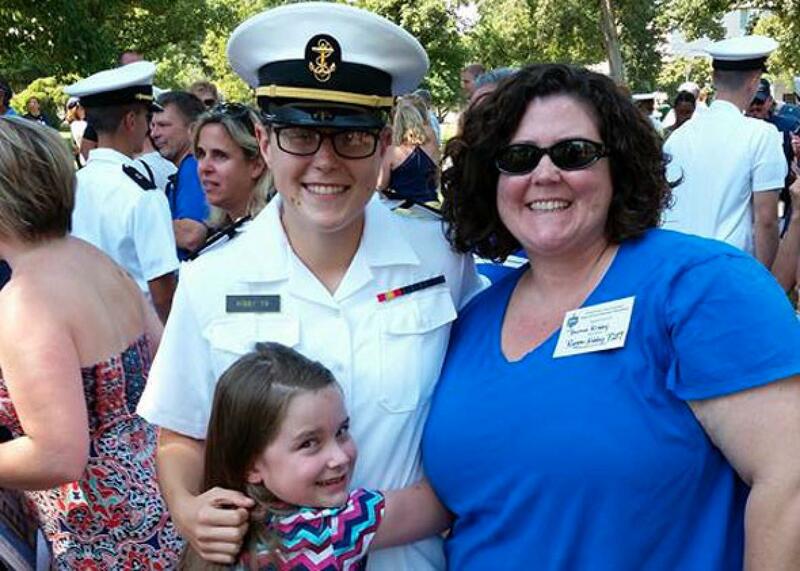 But Regan Kibby, a 19-year-old transgender midshipman at the United States Naval Academy, has identified himself as a plaintiff in a lawsuit brought by the National Center for Lesbian Rights and GLBTQ Legal Advocates & Defenders. Kibby, who wrote a declaration in that lawsuit explaining the devastating effects of the policy on his life and career, will almost certainly be expelled from the academy if the courts allow Trump’s policy to take effect. On Friday, Kibby and I spoke about his decision to join the academy, his reaction to the ban, and his involvement in the lawsuit. Our interview has been edited and condensed. Why did you decide to attend the Naval Academy? I lived in San Diego, a big military town, until the fifth grade. I grew up surrounded by Navy ships and people in uniform, and my dad was in the Navy. In high school I joined JROTC [Junior Reserve Officers’ Training Corps]. By the end of my freshman year I knew for sure that I wanted to go into the military. I felt a duty to serve; so many people are able to serve but choose not to, and it felt really important to me that I did. The summer after junior year, I attended the Air Force, Navy, and Army summer seminars back to back. Then I did a visit at the Coast Guard Academy. At school, I tried to make myself as competitive as possible for admission just to ensure that I could get into a service academy and go on to serve my country. And during my senior year of high school, I got my acceptance letter to the Naval Academy. You identified as a lesbian when you entered the academy. When did you realize you were actually trans? At some point I internalized the reality that you couldn’t be trans and serve in the military, and I really tried not to think about my gender identity. Everyone assumed I was gay because I acted in a more masculine manner, so it seemed easier to accept the label they gave me—it seemed to explain why I was a bit more masculine. It really didn’t, of course, but for a while I tried to make it fit. The feelings about my gender identity were still there on some level, but I tried to ignore them and push them to the back of my mind. I got to the academy in July 2015, the summer that the secretary of defense took steps to allow open transgender service. When I first heard that news, it got me thinking about all those things that I had been trying to ignore and repress about my actual identity because I knew I couldn’t be trans in the military. I began to be a little more open with myself. I thought, maybe this is what’s really been going on for my entire life. For a while it was just introspection, a process of self-discovery. Then I started talking to some of my friends at the academy, and to Navy Spectrum, a group for LGBT midshipmen and allies. I began coming out to more people, like friends and roommates, who were really accepting. By the beginning of second semester, I started coming out officially to my chain of command. Was it difficult to tell your chain of command about your gender identity? I was pretty scared at first, but they handled it extremely well. My company officer recognized that at the time there was no real policy for how the military was going to allow transitions. He still offered his unconditional support and treated me with respect. In the summer of 2016, the military released a concrete policy, and at the beginning of the next school year, he told me he’d do everything he could to help me navigate it. You were a bit of a guinea pig, then. I was the first one trying to do this at the academy. No one really knew quite what to do. Whenever a new policy is rolled out, it takes time for people to get used to it and get good at implementing it. I was the person everyone used to iron out kinks in policy and make sure they knew how to do it. It took longer than I would’ve liked. But I took comfort in the fact that I was doing everything I was supposed to do. I was following policy exactly as it was written and hoping it’d pay off. And I thought it had: By the end of the year, I had a transition plan and got my medical leave of absence approved. How did you learn about Trump’s tweets announcing the ban? I was at work—I’m interning at a law office during my leave of absence. I saw an email pop up from one of my professors at the academy. She didn’t go into any specifics but said she was sorry this was happening and offered her support. Immediately, I had this sinking feeling. I knew what it had to be about. I opened a new tab and saw the president’s tweets. At first I was just shocked. At some level, I’d known this was a possibility, but I didn’t expect it to come so abruptly, especially through something like Twitter. Once the initial shock wore off, I started feeling angry, sad, and scared. Being at the academy and in the military is something I had wanted and worked toward for such a long time. Knowing that I might not be allowed to stay was a terrible feeling. Also, I felt like I had to replan my entire future. That isn’t a position I ever expected to find myself in. How did you adjust your plans given the ambiguity of the initial tweets? A tweet isn’t policy, so until there was some guidance issued, no one really knew what was going on. After the president issued his memo [on Aug. 25], I got in contact with some of my chain of command. None of them really know what’s going to happen until the secretary of defense officially rolls out the new policy. I’ve also been in contact with my professors, who say they hate that this is happening and hope that I can come back. They’re willing to help me no matter what happens. Why did you decide to join this lawsuit? At first, I felt powerless to do anything about my future, which isn’t a feeling I enjoy having. Then a trans graduate of the Naval Academy reached out to me and said Shannon Minter [the legal director of the National Center for Lesbian Rights] was interested in speaking to me about joining their lawsuit. So I called Shannon, we spoke on the phone for awhile, and I realized that this lawsuit was a way for me to be able to take some of that power back. It’s a way for me to actively do something instead of just waiting for something to be done to me. Are you optimistic about your chances in court? The goal, of course, is to stop this ban before it fully takes effect. If we achieve that, it’ll be amazing. But even if we don’t get the result we want, this suit can still help other people. Maybe it’s too late for me. It’s not too late for young trans kids who want to serve their country when they grow up. And if standing up and sharing my story helps just one trans person know they aren’t alone, I’ll count that as a success.